With that intriguing introduction, I shook hands with Jim Barfield. We stood among the kiosks of Israeli goods during a lunch break at a Christian Zionist conference in Forth Worth, Texas. “A treasure map from the prophet Jeremiah,” Barfield answered. I gave Barfield and his companion a quick once over, trying to determine whether they were the well-intentioned kind of crazy or scary crazy. A small-town Oklahoma man with impressive posture, Barfield sported long (really long) grey hair and a full goatee. His partner in “The Copper Scroll Project” is Chris Knight. Knight, another long-haired fellow, speaks softly and possesses a gentle demeanor, but has the same look of confidence and conviction that Barfield exudes as they brief me on the Scroll. I took in the story with a bit of skepticism at first, but the longer we talked the more I thought that these guys may actually be onto something. The first thing I did after the conference was jump on my laptop and Wikipedia “Copper Scroll.” I also watched a documentary from the History Channel on the mysteries that enshroud the Scroll. I confess there was a gaping hole in my knowledge base since I had never heard of the world’s most intriguing archaeological find. The Copper Scroll was discovered in 1952 in one of the Qumran caves along the Dead Sea. 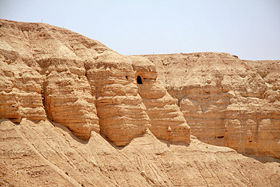 Though an anomaly among the more than nine-hundred ancient manuscripts, it is part of the official Dead Sea Scrolls Collection. The Copper Scroll differs from the others in that it is written entirely on thin sheets of alloyed copper rather than papyrus or leather. While most of the Dead Sea Scrolls were found by Bedouins and sold on the black market to antiquities dealers, the Copper Scroll was found by an archaeological team exactly where it had been waiting to be discovered at the back of a cave for over two thousand years. Unlike the rest of the Dead Sea Scrolls Collection, the Copper Scroll is not religious in nature. Instead, it is a detailed list of approximately sixty locations where vast amounts of gold, silver, coins, vessels, and other religious artifacts are hidden. When the Scroll was found it was rolled in two parts and badly oxidized. Fearing it would crumble, experts debated for five years the best way to open the brittle Scroll. Finally it was sent to a lab in Manchester, England where they cut the Scroll into twenty-three strips with a high-speed saw. Photographs of the strips were taken and eventually published. The Scroll itself was sent to the Archaeological Museum in Jordan since it had been found during an expedition sponsored by the Jordan Department of Antiquities. There are several theories as to where the treasure listed in the scroll came from and to whom it belonged. There are those who think it is just an ancient hoax. It seems odd that the Essenes, not known for their sense of humor, would create a fake inventory on expensive copper and bury it in a cave for a joke. The most popular theory is that the list details treasure from the Second Temple. In this scenario the Temple items were hidden just before Titus and the Roman army surrounded the walls of Jerusalem. The theory to which Barfield ascribes—and most Dead Sea scholars reject—is that the Scroll is from the First Temple period. Barfield looks to the Second Book of Maccabees and a lesser known seventeenth century book called Emeq HaMelekh (“Valley of the King”). Together these tell the story of the prophet Jeremiah who with the help of five Temple guardians, one named Shimur Halevi, carefully hid the holy objects of the Temple to protect them from the Babylonians and documented those locations on a scroll made from copper. Barfield is the first to admit he lacks the Indiana Jones background one would expect. He has no prior knowledge of the language, archaeology, or geography of the region. Instead he is a retired Oklahoma criminal investigator. Arson was his specialty and he was recognized as one of the Sooner State’s best. His spiritual hobby was studying biblical chronology, which is why he got interested in the Dead Sea Scrolls. Barfield says he woke up one morning in December 2006, after having a conversation with Vendyl Jones—a man who has spent his lifetime in search of the Copper Scroll treasures and was rumored to be the inspiration for Spielberg’s Indiana Jones—and decided to take a look at the translations of the Copper Scroll. He had read it once before in his work with biblical chronology and said, “I was totally bored by it. It was just a list of kosher metals.” But that morning was different. Barfield treated the Copper Scroll the same as he would an arson investigation. He used a process of elimination. When doing an investigation he tries to prove everyone innocent and thereby eliminates the fringe factors. With the Copper Scroll, he eliminated the fringe and came to a realization. After looking at the Scroll for five minutes he understood the first location and twenty minutes later he identified the next four locations. He and his wife took their first trip to Israel to confirm whether the sites and places that he had identified actually existed. “I wanted to make sure I wasn’t just imagining things,” Barfield said. It took six months for Barfield to crack the code for the rest of the locations. He has been to Israel four times subsequently, meeting with a top level archaeologist from the IAA who has committed himself to the expedition. Usually there is no shortage of red tape when it comes to conducting an expedition in the most religiously sensitive and politically fragile climate in the world. However, Barfield got the permit and will be going to Israel this winter on an expedition to one of the Scroll’s priority locations. The Copper Scroll Project says they are ninety-nine percent certain that they have found fifty-six of the sixty locations of the Copper Scroll; the other four they are just a bit shaky on. They readily admit though that they can not be sure the sites have not already been found and looted over the last 2,600 years. The quantities of precious metals that potentially lurk under the Judean hills and Negev sands are conservatively estimated to be worth over one billion US dollars today. Other estimates put the value at twice that, calculating between one hundred sixty and two hundred tons of gold and silver. However, the worth of the archaeological discoveries would be far greater than any monetary value.